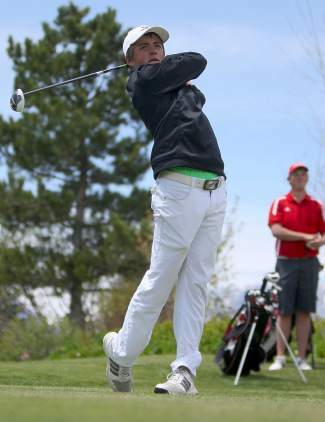 Mitchell Cornell owned a blustery Edgewood Tahoe Golf Course on Day 2 of the Division III state championship Wednesday. In windy conditions, the Incline freshman fired a 75 — the lowest round of the day — as he stormed back from an eighth-place tie after Day 1 to finish second overall in the two-day state tournament. Cornell, who finished two strokes shy of an individual state title, shot an 82 at Genoa Lakes on Tuesday. The young Highlanders also finished second as a team, posting a final team score of 896 to state champion White Pine’s 855. Whittell came in third with a team score of 935 and was followed by The Meadows (942), Needles (945) and Battle Mountain (957). White Pine placed three golfers in the top five among the 46-player field, including Nick Marich, who earned the individual state title with a two-day score of 155 (71-84). Cornell nearly caught him, as his 75 pulled him to within two strokes, at 157. Ty Pickel of White Pine was third just one stroke back, at 158 (73-85), while Quayde Brooks, an individual qualifier from Lake Mead, was fourth with a 160 (71-89). Chris Young of White Pine was fifth with a 161 (83-78). Sophomore Dylan Smith (87-87) and freshman Bryan Golombik (82-92) were the next-highest Incline finishers, as they each shot a 174 to tie for 14th. Senior Kyle Reeves carded a 195 (95-100) and senior Arjun Singh a 196 (95-101). Cornell impressed his coach most during his most difficult moment. On Day 1 at Genoa Lakes, he needed 10 shots to sink his par-4 third hole — the highest of his competitive career, Humasti said. But he played on as if it never happened, and went on to shoot even par on the back nine to salvage a respectable 82, which was tied with four others for eighth place. Senior Buster Fenley of North Tahoe finished 11th, shooting a 171 (80-91) over the two rounds.